We're doing a Gil Kane cover retrospective on Giant-Size Marvel, but here on Giant-Size Geek, we like to concentrate on DC material. Here are 4 silver age Green Lantern covers from 1968-1970 that made an impression on me as a kid. By the time I had seen Green Lantern #61 advertised, I had already learned about Earth-2 and the Golden Age Green Lantern from Justice League reprints. 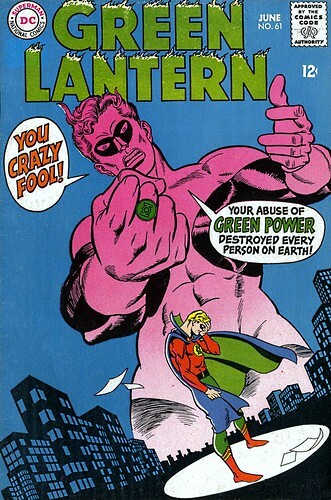 This image of Hal Jordan castigating blame on Alan Scott reminded me of a wrathful God. I wanted to buy any book that had one of the Earth-2 Justice Society heroes in it. 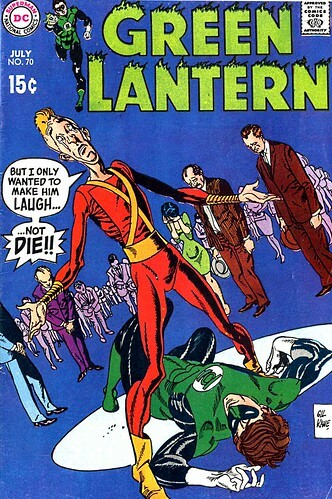 The cover to Green Lantern #70 confused me--I mistakenly thought the guy standing over GL was Elongated Man. That really looks like Ralph Dibny, doesn't it? My nose twitched and I bought the comic only to be disappointed. But I still love the people gathered around GL in a kind of existential despair. 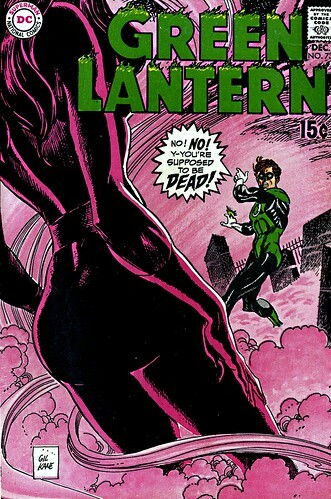 Green Lantern #73 was unique at the time because of the purplish color scheme, leaving no doubt that this story featured the return of Star Sapphire. Hal Jordan looks very afraid on this cover, doesn't he? Maybe he had more than just a weakness to the color yellow. This was the first of a two-part story. Green Lantern #74 featured the conclusion, with Sinestro joining Sapphire to beat down Hal Jordan. The sight of a depleted GL with his friend Tom Kalmaku urging him to recharge before his arch enemy advances--made this another must-have book. 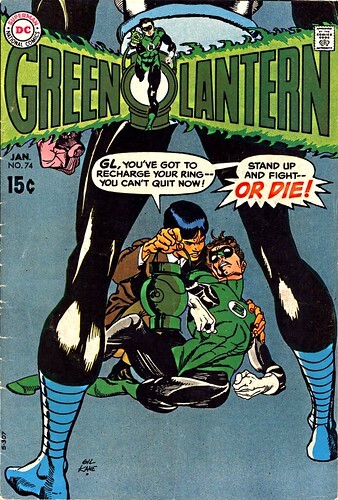 These were the last few GL comics drawn by Kane until Neal Adams took over in issue 76. Kane would later return to the character in the 1980s. Whenever I see these Gil Kane Green Lantern comics, I always think of Donovan's 1966 song, Sunshine Superman. It was played frequently during the summer of 1969 when I briefly lived in Los Angeles. I thought Superman and Green Lantern were two of the finest heroes on Earth, to be immortalized in a song! You can view my new Gil Kane gallery on Flickr. Nuff said.